I agree with a lot of the praise that's been given here. This pen liner goes on smoothly, leaves a lot of pigment and makes it easy to draw a continuous line. My one hesitation: I don't know if it was a fluke, but it did smudge once while I was wearing it, which I feel like shouldn't have happened since it's waterproof. I ultimately will defer to liquid-liner-lovers on this one. Say hello to simple, waterproof cat-eyes! Love, love, love! This is my new go-to liquid liner (and I've tried alot!) Love the flexible felt-tip pen which makes it so easy to draw on your line of choice. 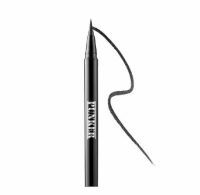 Because of the flexible tip, you are able to get right up to the lashline and flick out for the perfect cat-eye. It stays all day and holds up through light water splashes. Although the product isn’t 100% waterproof (expect some smudging if you splash water on your face) It glides on smooth and has a really dark and smooth formula. It gave me the perfect cat eye (much practice required) and there was no smudging throughout the day as at the end of the night it looked as perfect as it did right after application.